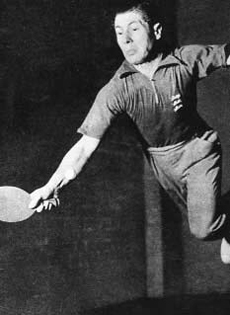 Winner of seven World Championships, including four Singles crowns, Richard Bergmann was regarded as the greatest defensive player in table tennis history. In 1936, he won his first World title as a member of the Austrian Swaythling Cup (Men’s World Championship) Team. He won his first World Singles Championship one year later and in doing so became the youngest player ever to win that title. table tennis player and toured extensively with the Harlem Globetrotters basketball team.